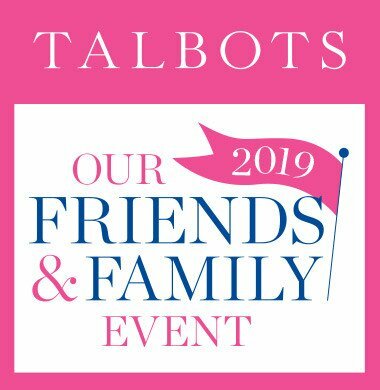 Talbots is a leading retailer and direct marketer of women's classic apparel, shoes and accessories. It’s our 2019 FRIENDS & FAMILY Event! Bring your bestie and enjoy 30% off your ENTIRE purchase, including NEW summer arrivals. Offer valid 4/25/2019- 4/29/2019. Promotional offers exclude Sperry®, Superga® and SPANX® products. Subject to availability. Talbots reserves the right to change or withdraw the offer at any time without prior notice. Offer may not be combined with any other offers, coupons or discounts and cannot be used for prior purchases. Associates of Talbots and its affiliates are not eligible.